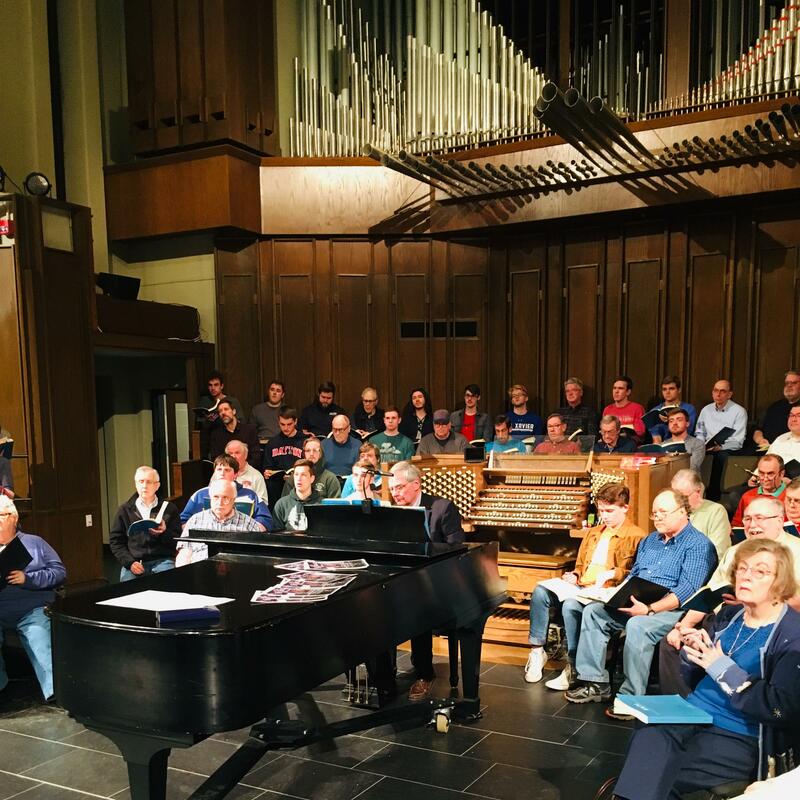 Music Director John Neely leads the Bach Society and the University of Dayton Chorale in their rehearsal for St. Matthew Passion, which retells the story of Jesus' capture, trial, and crucifixion from the Book of Matthew. Johann Sebastian Bach’s birthday is this Sunday, March 31st, and the Bach Society of Dayton will be performing one of his masterworks, a piece called St. Matthew Passion. It’s been billed as “the most significant choral composition in classical music,” and with good reason. In order to perform it, the Bach Society Choir will be partnering with the University of Dayton Chorale, members of the Dayton Philharmonic, and professional singers to tell the story of Jesus’ crucifixion. John Neely, musical director for the Bach Society, will be leading this army of musicians. For the performers, this piece is both a point of pride and problematic. Alan Kimbrough, seated at the piano, is the Bach Society of Dayton's accompanist. He's been performing Bach in public for over forty years now, but St. Matthew Passion still represents risk and reward for him. He notes that some performances use three different keyboard players, but on Sunday, Kimbrough will be playing all the keyboard parts. This is the second collaboration with a college the Bach Society has worked on in the last six months, and that’s one of their missions: to get more young people involved in music, and not just Bach. Now, they’re partnering with the University of Dayton, a Catholic College, to perform the story of Jesus’ crucifixion from the Book of Matthew with Easter approaching. University of Dayton sophomores Clare Carey and Maggie Feder say they’re up to the challenge. And Feder thinks that classical music in general, and Bach in particular, is a great starting point for anyone interested in music. “It underlies all modern music,” she says. “In order to really write detailed good stuff, you have to know how to do it and how to write it. That comes from Bach. Bach was the first person to write counterpoint." Steven Hankle directs University of Dayton Chorale. His students have been working on this since January: rehearing, listening to tape, learning German diction. He says he sees big epiphanies on the horizon for these young performers. This is just the fifth time that St. Matthew Passion has been performed in Dayton in the last 70 years, but the Bach Society of Dayton put it on just five years ago. That means they have a unique knowledge of what these kind collaborations take. They also say the program—that little pamphlet you get when you walk in the door—is key. It has the German on one side and the English on the other, so everyone can follow the story of the crucifixion while the double orchestra and the choruses and the nine soloists put their passion into the performance. The Bach Society of Dayton will perform St. Matthew Passion at the Kettering Seventh Day Adventist Church at 4PM on Sunday, March 31. Tickets can be purchased on their website. Culture Couch is made possible by a generous grant from the Ohio Arts Council.